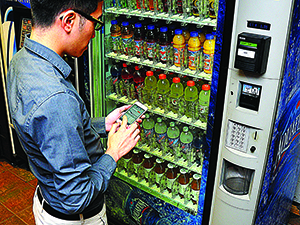 If you don’t have change to get a snack out of a vending machine at the University at Buffalo, The State University of New York (SUNY), don’t worry, just download the vending app. In April, UB Campus Dining and Shops (CDS) took over management of campus vending from a third-party vendor and established UB Snackin’, the new vending arm of the department. UB Snackin’ launched the app in August at the start of the fall semester. In the past, students were able to access their campus accounts with their UB cards to make purchases from the machines, but “this mobile technology gives them the opportunity now to utilize their phone—which we know students always have their phone on them. They may forget their card up in their room, but they’ll always have their phone on them,” explains Raymond Kohl, marketing manager for CDS. The app doesn’t recognize which machine a person is using just by standing in front of it, but after entering the identification number listed on the machine, that unit is then saved to the user’s “favorites” list and will appear in a drop-down menu the next time the user makes a purchase. After just one week the free app had been downloaded from the Apple Store and Google Play nearly 400 times, and the team anticipates more downloads—and increased purchases at the vending machines—as the word gets out. “I think we are going to see that, but there’s going to be several reasons. The convenience is one for sure. There’s also a cool factor,” Curtachio says.